This story is the first in a three-part series highlighting the histories and functions of campus spaces at Allegheny College. The College Archives and Special Collections at the Lawrence Lee Pelletier Library is home to thousands of materials, some of which date back to the 16th century. Allegheny Spaces continues next week. Three handwritten volumes of translations of a Greek bible were packed into a box in the early 1800s after the birth of Allegheny College. The translations were prepared by Charles Thomson, secretary of the Continental Congress during the American Revolution, and friend of Timothy Alden, Allegheny’s founder. After Thomson’s death, the translations were to be donated to the college because of Thomson’s connection to Alden. Using other books from Thomson’s library as buffers to protect the translations in the box, Thomson’s nephew sent Allegheny more than the young institution expected. Packed among the buffer materials, an original book from the Continental Congress made its way to Meadville. Fast forward to about eight years ago: A library in Harrisburg was working to compile an archive of Continental Congress works and publications and approached libraries around the country to investigate the whereabouts of such materials. One item was missing, but discoverable, due to Allegheny’s growing digital catalog. And the college’s accidental procurement of a Continental Congress book was resolved with the relocation of the book to the Harrisburg library, Jane Westenfeld said. Westenfeld serves as a research librarian at the Lawrence Lee Pelletier Library, working with students to develop research skills and use the library’s research tools, teaching classes to first-year seminar students. Wearing more than one hat, Westenfeld is the Special Collections librarian as well and is responsible for maintaining the thousands of Special Collections materials archived on the third floor of Pelletier, which also houses the College Archives. 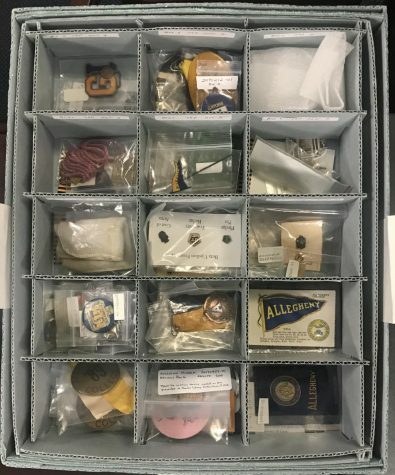 The Wayne and Sally Merrick Historic Archive Center on the third floor of the Lawrence Lee Pelletier Library is home to the Allegheny College Special Collections and College Archives, of which this box of small items is part. The updated shared space and archival program was funded by Wayne and Sally Merrick in the early 2000s as the Wayne and Sally Merrick Historic Archive Center. Wayne Merrick, late professor emeritus of political science and chair of the political science department, taught at Allegheny for more than 30 years. Now, to preserve “institutional memory,” College Archivist Ruth Andel said, the College Archives space allows stories of the past to be told. The College Archives is comprised of college records from faculty, administrators, students and alumni, committee meeting minutes, college and student publications and photographs — many of which have been digitized and made available on Artstor, a nonprofit, online repository for digital images used by organizations to make archived materials more widely accessible. Alumni often send items to the archives, Andel said, including small pins and collectible college cards that used to be included in packs of cigarettes. Club constitutions, course syllabi, curricula, flags, scrapbooks and countless other items are all archived as part of the college’s collective memory. 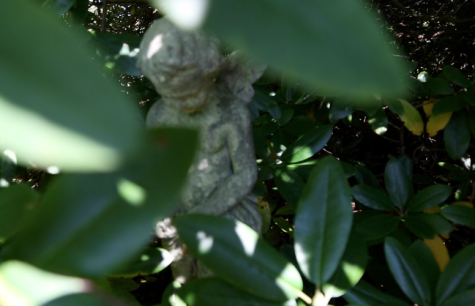 “There’s all kinds of little pieces of history,” Andel said. 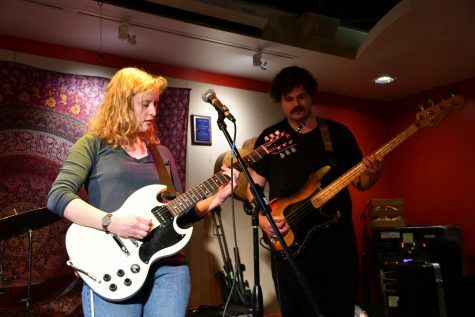 Materials that will eventually be added to the archives are being produced each day, so Allegheny’s archival program is an active one, and the process of managing the growing collection has evolved in subtle ways in the last decade. Incoming course syllabi are now sent to the archives in digital formats, Andel said, so those documents do not need to be scanned before being uploaded to Allegheny’s DSpace site, the online platform used to catalog the College Archives. Archived materials, especially those produced by hand before digital production became common, can be loaded into a flatbed scanner and uploaded to DSpace. The usefulness of this process, however, depends on the size and type of material being archived, Andel said. For any proposed major projects, outsourcing to organizations with larger and more advanced equipment must be considered. The digitization of The Campus newspaper, for example, has taken several years and was funded by alumni donors Darrell McClain and Carole McClain, both members of the class of 1952. The large scale project was managed by a company with a more advanced scanning capacity. 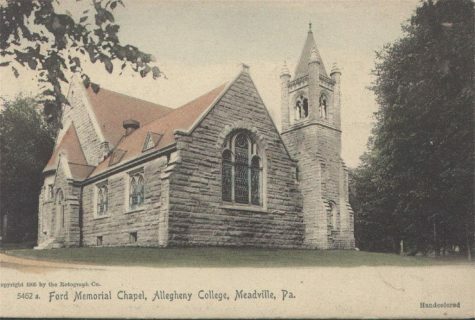 The McClains “knew others would enjoy reading the past issues of The Campus and wanted to make them available to Allegheny College alumni, students and friends so others could experience the same enjoyment they had,” the College Archives website reads. A short gap in digitized Campus issues in the early 2000s to early 2010s is evident on DSpace due to diminished funds, Andel said, but because of the ongoing digitization project, the first printed issue of The Campus, dated 1876, as well as more than a century’s worth of issues, are now housed both physically and digitally in the archives. Digital copies of The Campus on DSpace also feature optical character recognition, or OCR, which allows the files to be searchable, Andel explained. Searchable files can recognize a search query within any text in the digital document, making OCR-prepared materials more convenient for researchers. Pelletier Library has some software to link OCR capabilities to materials, but the process is still labor intensive as the recognition is not often “clean,” and it takes time for archives staff to clean up the recognition, Andel said. So outfitting materials with OCR is a selective process, and some materials do not end up having that feature. Andel, an Allegheny history department alumna, interned at the National Archives in the District of Columbia and took library classes following her 1985 graduation. 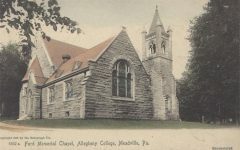 Andel then served as the archivist for Berry College in Georgia, before returning to Meadville to fill Allegheny’s archivist position in 2001. Andel described the College Archives as a space with several institutional and research purposes — a space for students to learn about and become familiar with primary source research, a space to explore family legacies and heritage and a space for writers to inquire about materials and photographs to supplement book and article publications. Similarly, Westenfeld fields requests for materials from the Special Collections, which is categorized by materials in three main ways: the Original Library, the Tarbell Collection and other materials, including 16th century illuminated manuscripts. Printed on vellum paper, which is long lasting and produced with animal skin, the Book of Hours manuscripts are Christian devotional books with medieval handwriting supplemented with ornate borders and illustrations. Some portions of the manuscripts are now available digitally on Artstor, and Westenfeld said she hopes the digitization of the remaining manuscripts will be completed this summer. The Original Library Collection includes the books and writings of the founder Alden’s peers, William Bentley, Isaiah Thomas and James Winthrop, as well as writings of Winthrop’s father, John Winthrop. Westenfeld recalled a particularly memorable experience she had a few years ago, when Princeton University Professor of History Anthony Grafton and a few of his colleagues were interested in the Winthrop family materials from Allegheny’s Special Collections. At the time, Grafton was working on an article chronicling the Winthrop family writings, “Passing The Book: Cultures of Reading in the Winthrop Family, 1580-1730,” published in the British history journal “Past & Present” in October 2018. 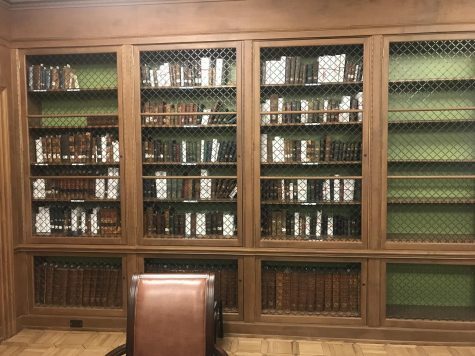 Though Westenfeld was not always around during the time the researchers sifted through the Special Collections, she did tell them they did not have to reshelve the materials as they looked through them. Winthrop books and boxes filled the tables in the Pelletier Library archives space. “They were like four kids in a candy shop,” Westenfeld said. Most of the Original Library materials were obtained by the college in the early 1800s while most documents in the Tarbell Collection were acquired by the college in the late 1940s after Tarbell’s death in 1944. With the help of Paul Giddens, Allegheny history professor who died in 1984, and Sarah Tarbell, Ida Tarbell’s younger sister, materials made their way to Allegheny. Four series make up the Tarbell Collection: Correspondence, Research Writings and Topics, Autobiography Material and the Lincoln Collection, as well as Tarbell’s own collection of books, not including books from her time as an Allegheny student. Since the late 1990s, the Tarbell Collection papers have been digitized, Westenfeld said, and most photographs related to Tarbell and her work on Abraham Lincoln have been organized and digitized as well. When the digitization process first began, Westenfeld said, the Tarbell photographs were just tossed and scattered in a map drawer, a large but shallow case. It took years, but Westenfeld said she finally got the photographs organized and dated. “Fortunately, I have a system where I can go in and find things quickly now,” Westenfeld said. Access to digital resources can save travel time and money for researchers, Westenfeld said, but she argued that the experience of seeing and feeling materials in person can be lost to digital space and that visitors to the College Archives and Special Collections have a chance to get a sense of the collection. A selection of books and student publications are displayed in the reading room of the College Archives. The College Archives and Special Collections are open to anyone interested in the material, Andel said, though priority is typically given to students, faculty and alumni. No matter the material form, the archiving process is essential for maintaining a record of Allegheny and the people who have walked through its grounds, supporting institutional accountability and paving paths for tomorrow. 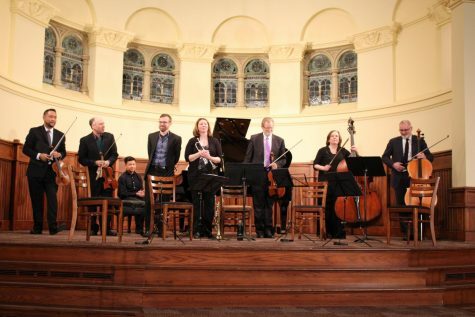 “You can’t move on to the future without some connection to the past,” Andel said.